HomeCinemaMasalaIrfan Khan does a Madaari at theaters! Irfan Khan does a Madaari at theaters! Irrfan Khan has come up with a unique idea, to place interactive standees with Damru’s in multiplexes. Irrfan Khan is riding high on the succes of Talvar and Piku. The actor’s upcoming next Madaari has created a lot of buzz and has created an audience awaiting the release. Irrfan has come up with a unique idea to promote his upcoming next. He has suggested to place interactive standees with Damru’s in multiplexes. People will need to hit the damru and write issue’s affecting the society on the standees. The idea behind the concept is to make a noise about the idea’s affecting the society and to wake up the nation and take responsibility of the situation. Damru’s have a very special significance in the film and this indeed is a very unique way to convey that. 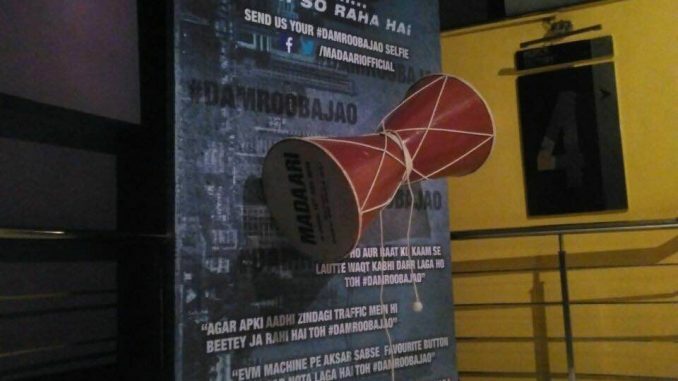 At the song launch of ‘Dama Dam’ from Madaari, Irrfan was completely in character. As he entered with a damru in his hand, he announced, “Hum apna kaam karenge, apna dharm nibhaayenge, dugdugi bajaayenge…koi jaage na jaage…dam damaa dam dam damaa dam…” With the spotlight on him, the actor made a call, asking the nation to wake-up from its state of unawareness. The trailer of Madaari has been received extremely well and has resonated with the audiences. The recently released songs of Madaari, ‘Dama Dam’ & ‘Masoom Sa’ have been garnering a lot of positive response and have tracked immensely. The movie is slated to release on 22nd July. Mohenjo Daro’s action poster packs a punch!